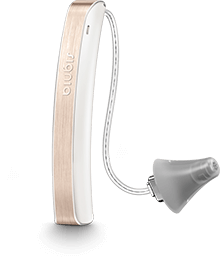 The Signia Styletto delivers a new dimension in hearing devices. Conceived as the world’s first high-tech hearwear, it’s designed for discerning individuals who want more from their device. With elegant styling and graceful lines, the Signia Styletto is made from top quality materials that create a jewel-like aesthetic. Fully rechargeable, the Signia Styletto delivers 16 hours of brilliant sound quality on a single charge and the portable charging case provides another three full charges. Styletto’s Speech Quality technology ensures that every conversation is clearly understood. Whether it’s an intimate chat, a discussion with a group of friends or a conversation in a busy restaurant, you’ll experience true fidelity. And thanks to Styletto’s Own Voice Processing, your own voice will sound natural and clear. A discreet remote control allows you to easily adjust Stylleto’s settings to suit your exact listening situation and in-built Notch Therapy enables you to tune out all distractions, including tinnitus, for a truly peaceful experience.